Leon I. Lock was born on August 2, 1924, in Harrisburg, Pennsylvania. He attended both elementary and high school in the Harrisburg City Schools. In 1942 at the age of 18, he entered Penn State University where he studied engineering. While at Penn State, he enlisted in the Army. He took all his tests and physicals at the Philadelphia Naval Hospital and left for basic training at Ft. McClellan, Alabama after his second semester was completed. From basic training, Mr. Lock was sent to ASTP (Army Specialized Training Program) at Hope College in Holland, Michigan. ASTP was the Army’s college education program to give its soldiers courses in engineering, medicine, dentistry, psychology and languages. Mr. Lock studied engineering there for one semester. He was then transferred to Camp McCoy, Wisconsin to join the 76th Infantry Division. In 1944, he was ordered to France with his division and from France to Luxembourg. From late 1944 to early 1945 he participated in Germany’s last great attempt to win World War II, the Battle of the Bulge. After the Battle of the Bulge, Mr. Lock was ordered back to the United States. He arrived in Norfolk, Virginia and was sent to the Philadelphia Naval Hospital. There he was examined and told he had lost 40 pounds in only five months. Since Mr. 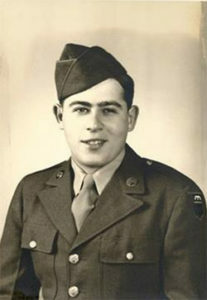 Lock had plenty of points to leave the service, he then went back to Penn State in 1946 as a civilian. There he joined Senior ROTC and graduated with honors from Penn State University in 1949 with a degree in Industrial Engineering. He was commissioned a Lieutenant in the Active Reserves in the Army Corps of Engineers stationed in Harrisburg, Pennsylvania. Because he was stationed with the Army Corps of Engineers, he was given a special button to wear on his dress uniform signifying that he was assigned to that unit. No other unit had those buttons. He stayed with the 315th Engineer Construction Headquarters until his father passed away in 1957. He retired as an Army Captain with twelve years of military service. He later became president of Chelsea Auto Parts Company and president of S&L Automotive Warehouse. He is a board member and former president of PAWA. He was also formerly on the board of PSIMES (Penn State Industrial and Manufacturing Engineering Society). He is still an active member of the Battle of the Bulge Association where those who fought in the war can talk about their experiences. It took many of the servicemen almost 50 years to speak about their experiences because no one really talked about the war directly after the war. Mr. Locke died on 14 May 2014. Learn more about Mr. Lock and his experiences in basic training and in Europe during the war, as well as learn more through his photographs and the history of the times at the web site set up by Dalton Heiland. Also see what Dalton learned from Mr. Lock about service and sacrifice of veterans at: OHP Reflection. The actual interview and transcripts will be archived at the US Army Heritage and Education Center, Carlisle Barracks PA. This oral history was organized under the auspices of Voices of the Past Speak to the Future Veteran’s Oral History Project sponsored by the Army Heritage Center Foundation at Carlisle Barracks, the Cumberland Valley School District Social Science Division in Silver Spring, and the Silver Spring Township Veterans Memorial Committee. This project links students to veterans in order to learn history first hand, and to inspire an appreciation to service beyond self and to honor the sacrifice of veterans. This program is looking for veterans to participate, as well as schools and veterans’ organizations to sponsor veterans’ oral history programs of their own. Learn more about this program through its description (VOHP Fact Sheet and conduct (www.cvschools.org/VOHP).